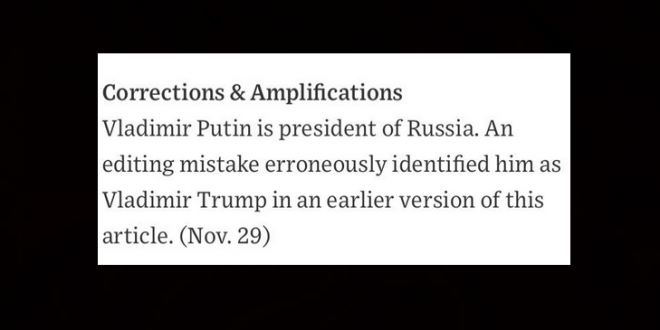 Wall Street Journal Issues Correction Of The Year - Joe.My.God. “Vladimir Putin is president of Russia. An editing mistake misidentified Mr. Putin in an earlier version of this article. (Nov. 29),” the publication noted at the bottom of an article reporting President Trump’s cancellation of a planned meeting with Putin at the Group of 20 summit this week. Trump had cited Russia’s recent seizure of three Ukrainian naval ships in canceling the face-to-face.